How to use Fine cleaner? Iron tip is pushed to the rubber side. The bottom board is removed and solder is disposed to a prescribed place. Rubber and the bottom board are detachable. 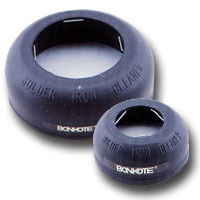 Solder residue on the iron tip is collected by jar that is made of heatproof rubber. Solder residue can be taken off from iron tip, either by pushing it to rubber side, edge, wire, or by beating it by edge. When B-500 is used to beat the iron tip by edge, solder residue is hardly dispersed. Temperature drop due to cleaning is only 2 - 3Â°C, so the problem of unsoldering will not occur. The heat shock of iron tip is small, and this gives long-life to iron tip and heater. Collection of solder residue and its disposal to a prescribed place is easy, and environmental problems would be solved in accordance with ISO14000.